Interested in a Career at Kickback Jacks? Join one of the most exciting, growing brands in the Southeast! Battleground Restaurants is a privately owned restaurant company based in Greensboro, North Carolina. 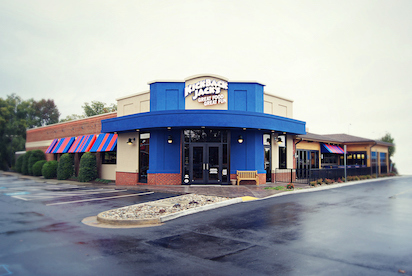 We own and operate 18 restaurants throughout North Carolina and Virginia and we are proud to be building 4 new Kickback Jacks Restaurants per year. This past year we have opened Kickback Jacks in Richmond VA, Greenville NC, Hickory NC, and Pinehurst NC. We will continue to grow at this pace with the addition of strong leadership to operate the restaurants. Our brand is very strong in all aspects of the business. We are a scratch kitchen because we believe in quality food. We have two full bars in our newly designed facilities because we believe in quality beer and specialty beverages! We have open show kitchens, indoor/outdoor patios with garage doors wrapped around the entire area, and an incredible audio/video TV and music experience because we believe in quality facilities. With this exceptional growth we are experiencing, we are currently hiring for salaried leadership positions in our restaurants. We offer great opportunities for personal and professional growth because we believe in building quality teams. We are looking for experienced and talented managers to join our team to help us with our exciting growth and to continue building our reputation for great food, great service, and great people! If you are interested in a high-volume restaurant environment and want to work with a company that truly believes in quality, then you might be a good fit for Kickback Jacks! Minimum 3 years salaried management experience operations. Personal belief in quality in everything you do. Full-service management experience with focus on building results. Excellence in restaurant operations AND team building. Why work for Kickback Jacks? You will have the opportunity to grow with us! We care deeply about our employees, expect a lot, but give just as much in return. We offer a competitive benefits package with medical and dental insurance and time-off. We strongly believe in a healthy work-life balance. We are family-friendly restaurant, and are closed on the holidays. If you are interested in joining our talented, dynamic team, then apply using the link below!